This is a good book about plants and their combinations in the garden, which I go back to many times for inspiration and ideas. When I first bought Planting Companions I thought it might end up being be one of my pretty pictures books - dreamy English border photos, with the text worth maybe a cursory glance. I was so wrong. I've read and re-read the text, and am always finding new treasures hidden in the photos. This is a book which inspires action and gives confidence. This book claims correctly to show 'winning plant combinations for every garden'. The pictures of the garden borders are really stunning. There are two tests for me of a good garden book: Firstly I need to be convinced that I could achieve exactly that look, that result, in my very own garden space - using gardening intelligence and initiative, not money. Secondly, the next time I read the book I need to be excited and inspired - just like the first read - and find new things that I missed the first time. 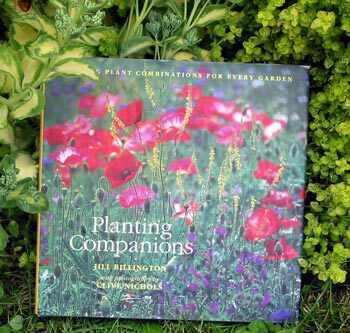 Planting Companions passes my gardening book test with flying floral colours!